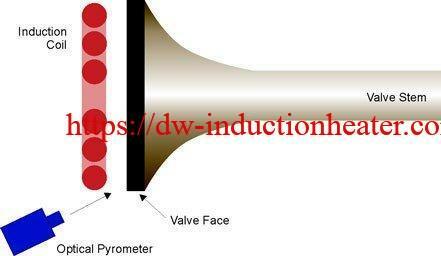 Objective To heat the face of an engine valve head to 900°F and maintain the temperature for an extended time, high temperature stress test. Equipment DW-UHF-10KW Induction Heating power supply, remote heat station with one 0.66 mF capacitor, a specially designed, multiturn induction coil and an optical pyrometer. Process A specially designed multi-turn pancake coil was used to provide uniform heat to the part. To provide optimum coupling, the face of the valve head was placed approximately 3/8” away from the coil. RF induction power was applied for 4 minutes to heat the larger valve to 900°F; the smaller valve head required 2 minutes to reach the same temperature. For closed-loop temperature control, the optical pyrometer was then used to maintain the temperature at 900°F. DAWEI power supply and induction coil at 900°F. Depending on the part size, the correct temperature was reached in 2 to 4 minutes.